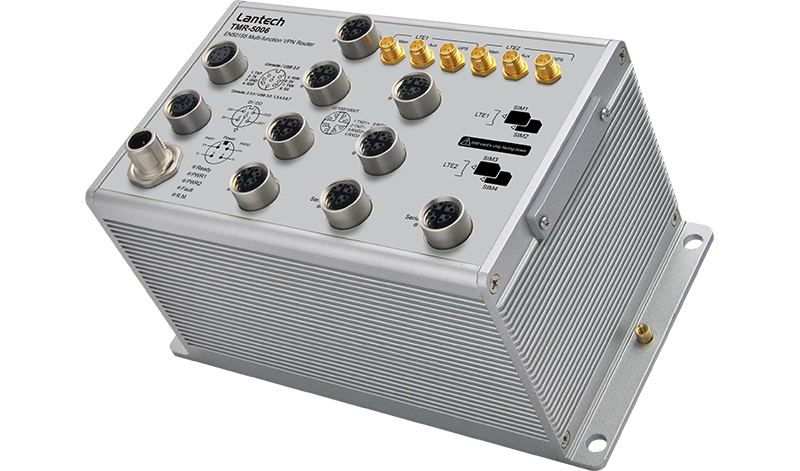 Lantech TMR-5006 series is a next generation EN50155 multi-function VPN router w/ 1 x 802.3ac Wi-Fi + 1 x LTE modem +6 Gigabit X-coded Ethernet switch + 2 serial ports that supports advanced function of VPN, Load-balancing**(Premium pack), EMMC Flash Storage**, Protocol gateway(Modbus), Storage**, and LTE dual SIM fail-over for industrial applications. The dual core CPU with 1.6GHz + 256M flash enables the router to multi-task smoothly. With dual LTE module design (2L model), 4 SIM card slots, TMR-5006 can allow auto-swap, failover & failback between multiple service providers for real non-stop connection. With concurrent LTE modules, it can also allocate bandwidth by “ Load Balancing** with 8 schemes between multiple WANs. Both GPS and Russian GLONASS systems are supported. It builds in 2 port serial connection for RS232; RS422/ 485 in which RS422/485 has 2.5KV isolation protection. The built-in Modbus gateway can convert Modbus RTU/ASCII to Modbus TCP for device control. Besides traditional VPN peer to peer tunneling, TMR-5006 support latest Multi-Site VPN function that is an efficient way for mesh tunneling. The registration is under cloud service and encrypted by SSH makes the connection easy and safe. It supports Multi-Site VPN, Open VPN, L2TP, IPsec L2 over GRE, NAT, and PPTP** for various VPN applications. The built-in Layer-4 firewall includes DoS**, IP address filter / Mac address filter* / TCP/UDP port number. The optional bypass relay is set to bypass the router to the next one when power is off in order to protect the network from crashing. Lantech bypass caters to remain in bypass mode until the router is completely booting up when power is back to avoid another network lost. Also it will be activated when detecting the router is hanged or link down. 2 sets of DIDO function can support additional high/low physical contact for designate applications besides Port / Power events, for example, DIDO function can trigger alarm if the router was moved or stolen. In case of events, the TMR-5006 will immediately send email** and trap. The event log can be sent via syslog, emails or trigger the alarm relay. When the router is at remote area with limited access, Web/SMS** control can help to get router status or remotely reboot by Web/SMS**. The TMR-5006 is able to work from dual 16.8V ~137.5V DC isolated input (WV model) that is particular good for vehicle, rail train, depot etc applications. The TMR-5006 supports editable captive portal function that allows administrator to force end-users redirect to authentication page. All standard models are non-conformal coating, optional conformal coating are with –C model name; Optional bypass models are available with –BT model name; QMA connector models are with –Q model name; -40~75C operational models are with –E model name.